Jennifer Goldman, CFP®, shared the benefits and how-to’s of transforming an advisory practice into a thriving, enjoyable business with the advisory firm owners on Right Capital’s webinar series for advisory businesses. Draft your own function chart to identify gaps in capacity and work overload. Ideate what content you want your own and the client experience to contain within the technology. Then infuse specific technology to lower the workload, and create the experience you want for yourself, staff, and the clients. 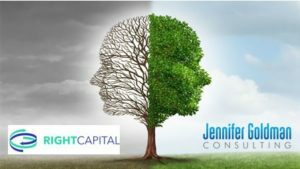 Full presentation slide deck: 2017 Right Capital Webinar with Jennifer Goldman Consulting. If you are craving solutions and ideas to build a thriving business, SUBSCRIBE to our monthly solutions newsletter. And thanks for learning how to transform your business!